But how does the manual step fw work? What happens when I push the button? Does the sequence stop? if you have turned the clock off (555 timer) or if you are running the clock at slow rate. when you push the manual step fw button the sequencer jumps to the next step (and stays there until you push again or the clock start beating). Aha, I see. So when pin 14 on 74HC4017 is grounded it steps forward, right? Could the CV be connected to both the VCOs at the same time? both VCOs can be run by this. yes. have you got your SL up and running ? i have my SL still on construction. . . so i haven't been able to test the sequencer on it - it should work but i don't know maybe there is something that needs to be fixed. No my first SL is also still under construction, I got all the parts for the front panel yesterday. I'll be doing a stripboard layout for this sequencer just as soon as I get my SL finished. That shouldn't be too far away, I'm doing the interconnections to the front panel now, and I just ordered the LFs. I designed a stripboard layout for my SL so it shouldn't be too hard to do the sequencer. I might even start it before the SL is finished, but I wouldn't be able to gaurantee it's accuracy until I've built it. uncle-krunkus you are a one crasy stripboarder. How about a switch in series with the speed-pot? In digital circuits, it's generally a bad idea to put switches directly in the circuit. Instead connect switches to the inputs of gates. For example, connect a clock signal to one input of a NAND gate and hook the other input to the center tap on a switch. Also, to this input connected to the switch, connect a 100K resistor to Vcc and a 0.01 uF capacitor to ground. Connect one of the free taps of the switch to ground and leave the other end open. Now, when depending on where you have the switch set, the clock will be gated on or off. Of course, you can also use AND, NOR, or OR gates too. Using gates beats direct connection of switches because of better noise immunity, and you can build control structures. For example, why not put in a control the turns the sequencer on or off depending on the level of the input to a voltage comparitor? Gasp, I want to draw a schematic. Daniel, are you using a free schematic editor I might learn to use pretty quickly? Talking about circuits isn't the best way to communicate. How slow is the slowest sequence rate? maybe thats enough time to set the CV for each step? one picture says more than 1000 words and i think one schematic says at least the same amount of words that average picture. maybe some one have all ready draw them to schematic editors component library .cpt-files? i must say this again and again. this forum have a special place in my heart and i think this is just one of the best places that i have found. it depends on the capacitor and the pot used. this is just showing of i know. but i had the chance to use my friends photographic studio so here is a photo of my Sequencer prototype. the leds running in the bottom row indicates the steps. the last led on bottom row is the clock rate led and above it it the clock rate pot. the leds on upper row are gate on indicators and the switches are for gate on/off. reset on step switches are inside the box. manual step fw button inside the box. I just added .cpt files to the list of acceptable extentions. Let me know if you have any problems. Dnny, thanks for that download link for the Schematic Editor. I downloaded. It looks just great for small projects. I really wish I had a PC. I've emailed Ray Wilson to ask if there is a possibility of an OSX version- which there isn't, but he's willing to release the source code to anyone who wants to develop it for the Macintosh. (I wouldn't know where to start). Anybody interested? 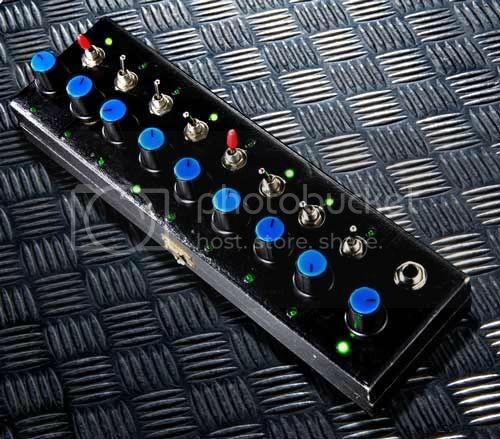 This simple sequencer project is looking really great, I'm eager to order the parts later on today. I might just have to build a few, a couple for my diy modular synth and i might build a soundlab and sequencer into an attractive box. I might just have to build a few, a couple for my diy modular synth and i might build a soundlab and sequencer into an attractive box.! 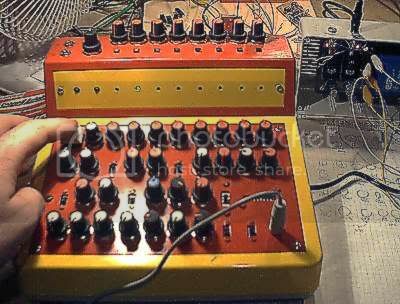 the idea off this simple sequencer started when i saw J.Schmitz DIY synth the Pig. "The Pig" is a very simple, little synth with 2 VCO's, 1 voltage controlled state var Filter, two Attack-Release Generators, VCA (of course), 2 LFO's (one of them with audio freq) and two 8-step sequencers. The first sequencer modulates the two VCO's, the second one is for filter modulation. 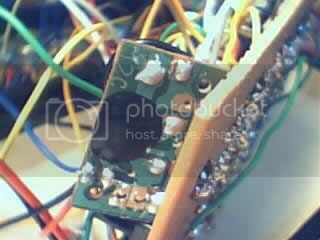 in my prototype see photo above i use toy sound chip that makes sound of breaking glass. and whit the pots you can chance the speed of replay. oh cool, what is it from? is it bought on its own? i found it from my Little sisters toy box. its insides of happymeal toy from the big and bad fast food company. I'm still having some problems whit the sequencer i think i need to chance the 4017 - because i did heat the legs quite a lot . . .
the realm of my comprehension. I did want to add though, and say that this sequencer is coming along very nicely. Great proto and heres to a job well done. Thanks for your contributions dnny. Mybe when its all said and done someone will come out with a layout so the inept may enjoy the fruits of your labor. "your stripes are killer bro"